Greetings from the WhereBridesGo.com Team!!! Summer weddings can be so romantic, but there can be some real challenges that must be addressed in order to have the beautiful picturesque wedding that you have been dreaming of ... especially during the heat and humidity of summer. Below are a few tips from the WhereBridesGo.com Team that will help you stay cool in the heat of that fabulous moment. Have a back up plan - We understand your desire to have the outdoor wedding of your dreams; however, if the heat persists, you must consider the comfort and health of your guests. Have Plan B and be prepared to initiate it if necessary. 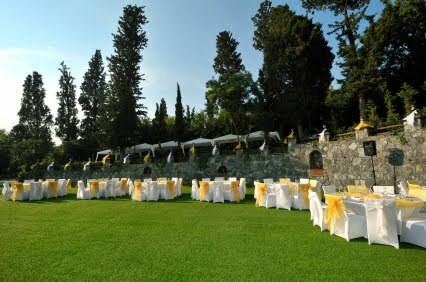 Timing of your Ceremony – Schedule your ceremony later in the day rather than in blazing hot afternoon sun. The sun will be a little more forgiving in the late afternoon/early evening. Wedding Favors – select wedding favors that will benefit your guest during the warm temps of your ceremony. For instance, sunscreen, folded fans or program fans and as mentioned earlier, personalized bottles of water. Shade – Prior to the wedding date during similar temperatures, it would be a good idea to actually stand in the ceremony location at the designated ceremony time to experience the elements that you and your guests will encounter. If shade is unavailable, it might be a good idea to consider tent rentals for your guests comfort. If you have guests that you are certain will need a little extra care (elderly or ill) on the day of your wedding you might consider personalized umbrellas to ensure shade will be available regardless of their location. Bugs – those pesky little bugs of summer can destroy the beauty of any outdoor wedding. Consider using bug repelling Torches to outline the perimeter of your space as well as bug repelling lamps and candles throughout the space. With a little planning, you can still enjoy that beautiful summer breezy wedding day that you have dreamed about.